Background: Spigelian hernias are a rare type of hernia that occurs through a defect in the anterior abdominal wall adjacent to the linea semilunaris. Estimation of their incidence has been reported as 0.12% of all abdominal wall hernias. Traditionally the method of repair has been an open approach and that to, only identified once there is pain or obstruction from incarceration of the hernia. Herein we discuss laparoscopic repair of incidentally identified spigelian hernias. 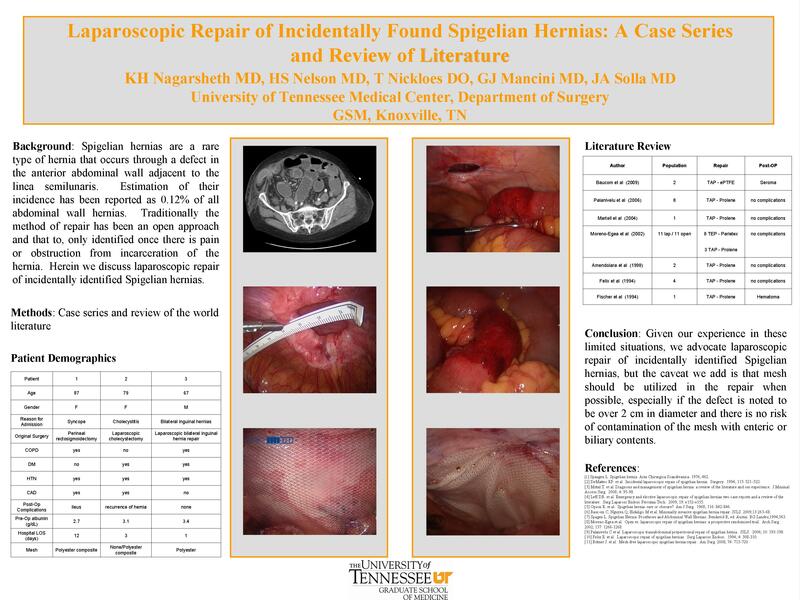 Cases: Three patients are presented all of who were evaluated and taken to surgery initially for a differing disease process, and all of who were incidentally found to have spigelian hernias. These patients underwent laparoscopic repair of their hernias and two were repaired intraperitoneally and one was repaired totally extraperitoneally. Two initially underwent a mesh repair, while the third had an attempted primary repair. The patient who underwent primary repair ended up having recurrence of their hernia and bowel obstruction that was subsequently treated with a laparoscopic mesh repair. All patients are currently doing well with no further sequelae. Conclusions: It is reported that only 50% of all spigelian hernias are diagnosed in the pre-operative period. There is evidence that supports the use of laparoscopy for both diagnosis and repair of spigelian hernias, and there are reports of successful repairs both primarily and with mesh. The hernias that are reportedly successfully repaired primarily without mesh are < or = 2 cm in diameter. In our experience with the preceding three patients, we found that laparoscopic repair of incidentally discovered spigelian hernias is a viable option and we also found that implantation of mesh, when possible, resulted in satisfactory results and no recurrence.